Glassblowers get some odd questions that are a little difficult to answer. I personally got asked this by someone during my interview to blow glass on a cruise ship…. While I was demonstrating how completely un-hireable I was as a glassblower at the time. So I’ve thought about it for a few years, and asked a physics professor, (who gave me a boilerplate, ‘because bubbles are round,’ answer) and now there are diagrams. 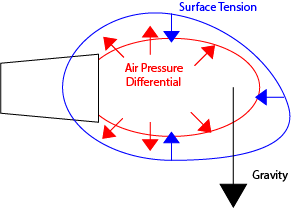 The Surface tension of the glass resists the outward push of the air pressure differential, while gravity pulls the weight of the glass itself down. 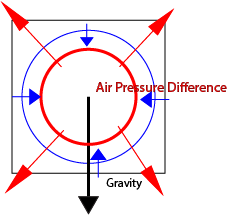 The result is that a glassblower is required to continuously turn the glass in a circle to keep the glass more round; the force of the gravity needs to constantly affect the bubble itself in a uniform manner if possible. So the closer to truly continuous uniform circular motion the glass gets, the more round the glass will stay. This is a difficult thing to learn, and is one of the first problems a new glassblower encounters. A free body diagram of the process looks like this. 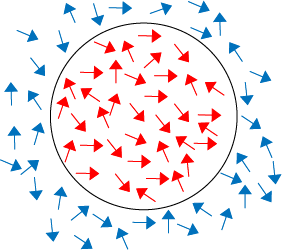 The red arrows represent the more dense moshers pushing the bubble outwards, while the blue arrows represent the uh…. Plastic mesh fencing trying to hold them in. I guess gravity would be the band, which everyone wants to be closer to. So you try and put the whole crowd on a turntable. Yeah. This metaphor has gone too far. The diagram below shows all the forces as applied to a somewhat perfect bubble. Everyone has a minutely different favorite shape for different types of bubbles for different purposes….. But the glass is on center. The surface tension is pushing in equally (partially, probably, due to marvering, which is a whole separate discussion) And the glassblower has kept the piece on center. This one’s probably too round at the tip by a bit for certain applications, but you get the idea. 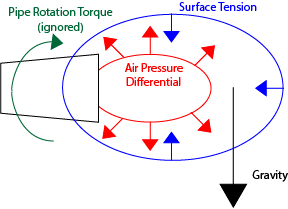 When this uniform circular motion is not achieved effectively, the wall thickness of the glass changes in unexpected ways, leading to the surface tension of the exterior being inconsistent around the edge of the glass. This second pair of pictures shows the glass in a marginally less ideal diagram. This second bubble diagram hasn’t been turned uniformly. Therefore, there’s a thin spot towards the bottom. Since the bubble blown into the glass will remain circular, the spot which is thinner will continue to thin out. Which can lead to a cascading failure where the surface tension spirals towards being progressively more uneven with the wall thickness. 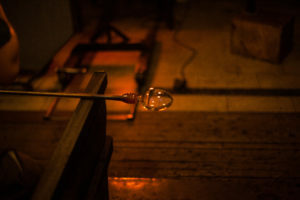 Sean O’Neil ( http://www.studiomanufact.com/ ) once asked me what I thought the advantage of being a left-handed glassblower was. 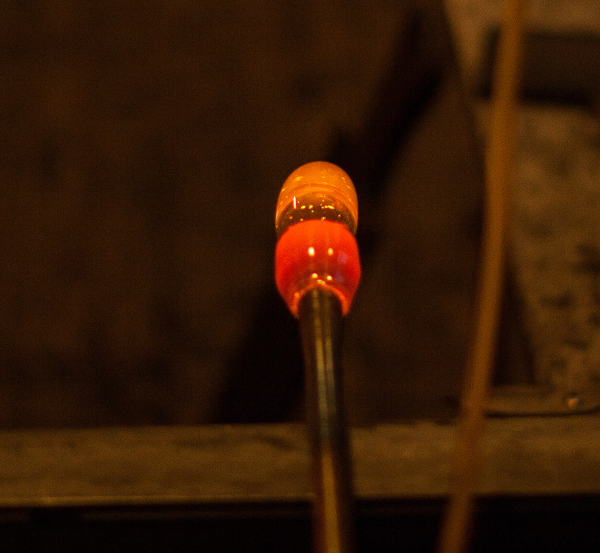 All the tools in glassblowing are made for right handed people. Heinlein even mentioned left-handed glassblowers disparagingly. (“First thing [the military placement officer] does is check whether there’s any need for left-handed glassblowers this week,” Starship Troopers) The fine-detail manipulation of bits done in Venetian glass is done with the right hand, which makes it tougher. I personally believe, however, that there are two. Firstly, people who use their left hands for stuff are used to learning new tools twice. Once the way everyone else does it and once with a tool designed for their 10% of the population. Having learned to type with two separate layouts I found it made me more effective at both layouts in the end. Generally, in my experience, cross training your brain is an effective means to the end of surpassing a previous limitation. However, when attempting to make on-center and uniform objects using gravity my belief is that lefties have the advantage from the beginning. This is because the hand that is working with and against the forces of gravity to keep a piece on-center is the left hand. Silver lining in every cloud. Here’s a picture of a pretty goblet bubble. OOooooooooo aaaaaaaaahhhh….. That became something pretty nice. Anyways. Thanks for reading. Share this with your friends, please, if you think they’ll be interested, and feel free to ask for more explanations. I like answering questions and talking to people. Next Programming as a human service.